I have just returned from spending a great holiday with my husband. Choosing a location was easy enough, in the sense that as airports are not our favourite places it was a holiday in Ireland, Northern Ireland, Scotland, Wales or England. England won the toss and deciding on a journey from the ferry of not more than 3.30 hours led us to the county of Shropshire and the town of Ludlow. Well we ended up staying in the village of Claynham about 3 miles outside Ludlow. The house we rented was just beautiful. It was a converted byre which was stunningly restored. The original beams were retained. modern décor throughout which highlighted the oak beams and showed off the oak floor throughout. But the modern kitchen was just a dream. One of my biggest worries when away is where to eat and trying food. I don’t fancy being ill so by renting a house and cooking in, I have found a way of enjoying a holiday. However, it is not always feasible and sometimes I just do not want to cook. So, when I find an eating establishment which serves good food, well cooked I love to talk about it. 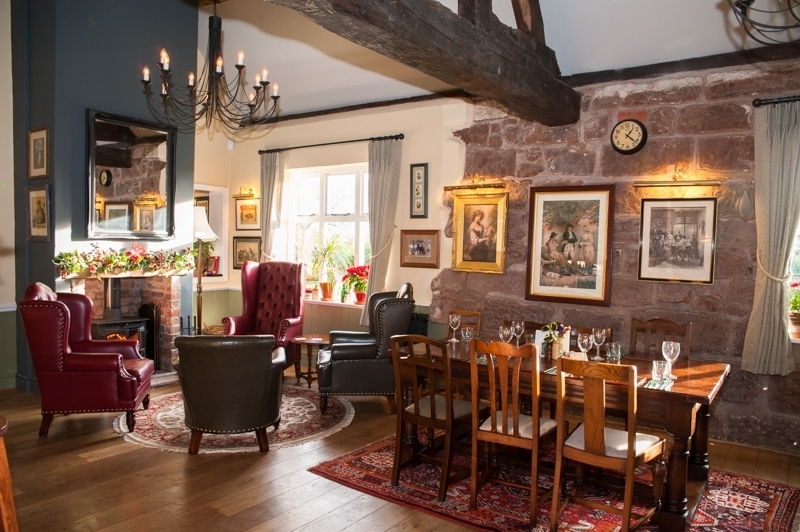 It is an old pub which has been tastefully renovated. There are airy areas as well as small nooks. The toilets are spacious. What I also liked was the photographs which gave you a little piece of history. It has a great menu that is traditional but with modern twists. The staff are extremely friendly and knowledgeable. One word of warning if you do not like dogs in food establishments then avoid the inn. While there, we decided on a selection of starters rather than a main course. Chicken Liver Pate with carrot and apricot chutney; homemade Black Pudding with poached egg and shallot puree; a selection of granary breads; Beetroot humus and portion of traditional chips. I can honestly say that every plate was practically wiped clean the food was so delicious. Although this is just one of many in the Brunning and Price Pubs it is very unique and well worth a visit.